On our Domaine of 1 hectare, there is an impressive old farmhouse from 1780, built in the typical lauragaise style. We have been welcoming guests for a wonderful stay in one of our choices of accommodation since May 2011. You can stay here in one of the six safari tents (incl. bathroom), two gîtes, gîte L'Atelier with tree house and two guest rooms (bed and breakfast). 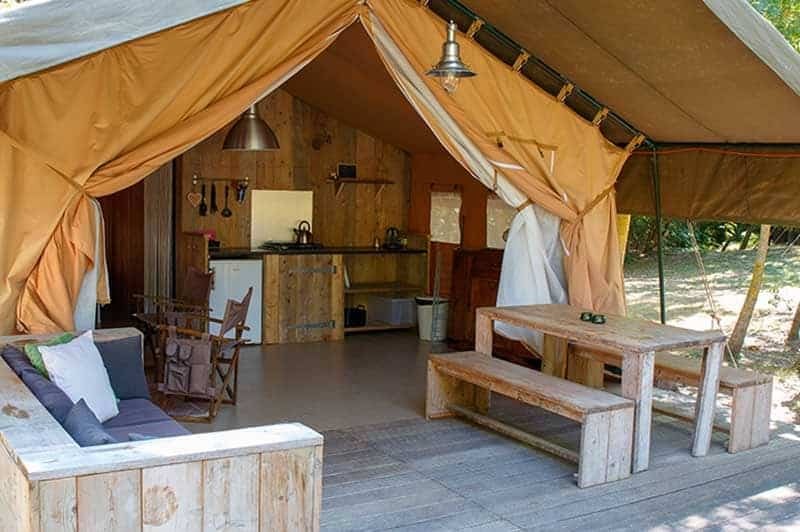 You will experience the real outdoor feeling in one of our six luxury safari tents. Convenience and comfort are paramount: Camping is fun, but especially if you sleep in a comfortable bed, you have a kitchen at your disposal and, above all, a private bathroom (less than a minute walk from the tent). You can also enjoy a cozy and comfortable stay in one of the gîtes: l'Etable, Le Grenier or L'Atelier. This charming gîte is centrally located in the main building, on the ground floor and can accommodate up to four people. The gîte has two bedrooms, a spacious bathroom and a living room with open kitchen and French doors to the private terrace. Le Grenier is on the first and second floor and can accommodate up to 6 people. A living room with open kitchen is on the first floor and a staircase leads to the second floor with two bedrooms and a bathroom. In front of the gîte is a lovely, private terrace, complete with comfortable sofa. L'Atelier is truly the jewel of Birbès. The detached little cottage, winter 2015-2016 completely renovated, is centrally located at the Domaine. L'Atelier consists of a spacious double room with open bathroom and separate toilet. A beautiful, partly open, partly covered terrace completes L’ Atelier. The covered part of the terrace can be closed with sliding doors and even heated with a cosy wood burner. It is possible to place a baby bed in L 'Atelier. Even one or two children can sleep with mom and dad on a sofa bed. Since 2015, we have expanded L'Atelier a fantastic and cool tree house. With the treehouse, the L'Atelier is an accommodation for a family of up to 6 people. The treehouse is a full bedroom for up to 3 people. There is power and the necessary safety measures is of course ensured. This accommodation is suitable for children over 7 years. You can book the treehouse as a separate accommodation as well as in combination with L’ Atelier. If you want to experience full service, than the Chambre d’ hôtes (Bed and Breakfast) is an excellent option. You can choose the Chambre Les Voisins or Chambre Les Missionaires. A beautiful original old door gives you access to 'Les Voisins' room, adjacent to our private house. This spacious room has views of both the southern and northern side of the Domaine. 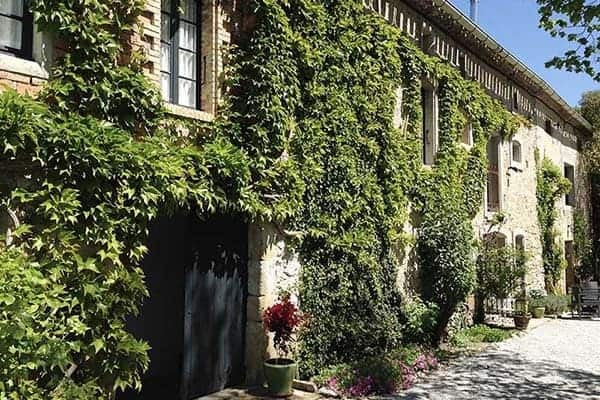 'Les Missionnaires' takes its name from the first inhabitants of the Domaine and Birbès: the brothers Jean and Prosper Birbès, both once a missionary in the Far East. The room is located at the rear of the house and has a nice view of the backyard and surrounding corn and sunflower fields. Beide kamers zijn voorzien van goede tweepersoonsbedden (indien gewenst te splitsen in twee eenpersoonsbedden van 90×200) en een eigen badkamer met douche, wastafel en toilet. Op de kamer is er de mogelijkheid om thee of koffie te zetten. Iedere ochtend serveren wij een heerlijk uitgebreid ontbijt en aantal keer in de week kan je ‘s avonds gezellig aanschuiven bij onze Table d’hôtes. In high season the two chambers are only rented together, per week and in combination with the use of the large outdoor kitchen. As a family, you can also choose to stay in our two guest rooms; 'Les Voisins' and 'Les Missionnaires', or 'Les Chambres’. A big advantage is that both rooms, located right next to each other on the first floor, each has its private bathroom. Especially for families with older children very practical! For our guests of Les Chambres is next to our hangar a large private terrace with the best views of the Domaine. With views of the hills and fields which are alternately grown with corn, maize, and sunflowers, you can admire daily from your terrace the most beautiful sunsets. In high season the two chambers are only rented out together, per week using the large outdoor kitchen. In the hangar (large, partly open, roofed barn) is a cool, big and very complete equipped outdoor kitchen. From this kitchen, we also prepare twice a week our table d'hôtes. The Grenier and L'Etable gites are rented during the high season per week (Saturday to Saturday); Arrival from 16:00, departure before 10:00. In the early and mid-season, it is possible to rent the gites Le Grenier and L'Etable for a shorter period, however there is a minimum of 3 nights. Prices include tax, electricity, water, bed linen (changed once per week), towels (changed twice a week), and kitchen linens. Final cleaning for gîtes: an extra € 60 will be charged (obligatory). There is a standard charge for energy costs for the period 15 September to 1 June of € 5,00 per day. During the high season L'Atelier is only available to book as family accommodation, coupled with the tree house. L'Atelier is for 2 adults and up to 3 children (minimum age - related to ree house safety - 7 years). The property is rented per week, arriving and departing on a Saturday. In the low and mid season L'Atelier is reserved as accommodation for two people (only L 'Atelier) or as family accommodation (L' Atelier along with the tree house). When L'Atelier is booked as two-person accommodation (without the Tree house) - without additional costs - one cot can be added. If more than 1 child is staying in L'Atelier, € 50 (per week / per child) will be charged extra. During this time, L 'Atelier can also be booked for a shorter period, with a minimum of 3 nights. Final cleaning for L’ Atelier: an extra € 60 will be charged (obligatory). The Tree house can also be booked as a room (maximum 2 people) in the low and mid season: as a chambre d’hôtes, per day and with breakfast included. In high season the Tree house is only rented in combination with L 'Atelier. Prices include tax, electricity, water, bed linen (changed once per week), towels (changed twice a week), and breakfast (in mid and low season). In the low and mid season, the rooms will be rented per day, breakfast included. In the low and mid season, a discount of 10% on the above rate applies for a minimum stay of three nights. In high season, rooms are only rented out as family accommodation: both rooms are rented together, coupled with the use of the outdoor kitchen in our hangar. Like the gites these rooms are rented by the week in high season, as family accommodation. Breakfast is not included during this period and € 60 will be charged as a cleaning fee (obligatory). Prices include tax, electricity, water, bed linen (changed once a week), towels (changed twice a week), and breakfast during the low and mid season only. he safari tents are available to rent during the period mid June to mid September. In high season it is only possible to book the tents per week, from Saturday to Saturday. Arrival from 16.00 on the day of arrival, departure before 10:00. In mid-season safari tents can also be booked for shorter periods, with a minimum of 3 nights. Final cleaning for safari tents: an extra € 50 will be charged (obligatory). A baby bed and highchair are available free of charge upon request (please reserve in advance as supply is limited). Pets considered, after consultation. The fee for the stay of a pet is € 7,50 per day. On booking we require a deposit of 50% of the total amount. The reservation is final only after the deposit has been received (and its cancellation policy valid – I wasn’t sure about the meaning of this – please contact me and we can discuss). The remaining amount must be paid at the latest upon arrival. It is not possible to pay by credit or debit card with us. The General Conditions apply to all accommodation.